Soviet MBT introduced as the replacement to both the T-54/T-55 and T-62 series of tanks. A completely new design, although somewhat resembling the T-62 in its turret, it initially mounted a 115mm main gun; the T-62 was upgraded in its definitive T-62A version to the formidable 125mm smoothbore gun. The T-64B fires the AT-8 Songster antitank guided-missile with a range of 4,000 meters. Not exported because of its complexity, the T-64 was issued only to Soviet tank units. Although the T-62 was simply an improvement of the T-55, the next Soviet MBT, the T-64, was a completely new design that represented a considerable advance in firepower, armor protection, and speed. The latter was a major priority as the T-54/T-55 and T-62 series tanks had difficulty keeping up with the new BMP-1 IFV. 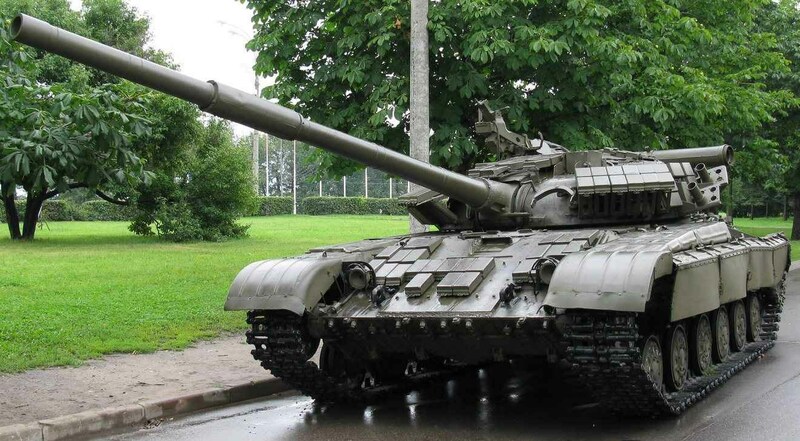 Entering production in 1966 and designed to replace both the T-54/T-55 series and T-62, the T-64 nonetheless suffered from automotive and suspension problems. The T-64, which somewhat resembled the T-62 in its turret area, weighed some 92,600 pounds. An autoloader eliminated the need for the loader, reducing crew size to only three. Powered by a 750- hp engine, it had a maximum road speed of 47 mph. Initially the T- 64 was armed with a 115mm gun, but Soviet designers decided that the tank was undergunned against the U. S. M60A1, and they upgraded the definitive version T-64A to a more powerful 125mm smoothbore. The T-64B version could fire the 4,000 meter-range Songster antitank guided missile. The T-64 also mounted two machine guns and had maximum 200mm armor protection. The T-64 had a new suspension system. Rather than large road wheels alone, as was the case on the T-55 and T-62, its suspension utilized six small road wheels and four return rollers. Skirting plates provided some protection to the return rollers. This new system provided excellent cross-country performance. Uncharacteristically for Soviet tanks, the new engine had serious reliability problems, as did the transmission, fire-control system, and loader. As a consequence, although the Soviets produced some 14,000 T-64s and reequipped their own forces with them, the tank was never exported. Instead the Soviets exported the follow-on, somewhat less-capable T-72. Armor: maximum 440mm (laminate/steel/ reactive) the T-64 which was 13cm thick Black Ceramic tile mounted on Steltexolite [like fiber glass] sandwiched between Cast RHA to a thickness of about 44cm. This entry was posted in AFV, Soviet by MSW. Bookmark the permalink.